Professional tools are simply essential in the gastronomy. You are in this context particularly important because we are here concerned mainly to a high degree of functionality. In this environment, it was primarily established Bartscher products that are characterized by a variety of attractive properties. The gastronomy equipement from Bartscher is especially popular in restaurants, because this manufacturers producing very robust, high quality and easy to clean products. If you opt for products from Bartscher, you can be sure that it is purchasing a durable product, which is also the highest demands. Another product line, which one should mention in this context that are different from pizza ovens Bartscher and Apexa. These high-quality pizza ovens are available in two versions, with one or two separate baking chambers. So you can simultaneously cook two pizzas without having to mix their different flavors. A pizza oven is essential in any functionally equipped gourmet kitchen to create a wide variety of culinary delights. Star chefs from around the world swear by the pizza ovens from Bartscher and Apexa. In summary, we can only report good things about the various products of Bartscher and Apexa. Whether pizza ovens, plate warmers and soup pots - the product range of Bartscher impressed by variety, quality and a unique price / performance ratio. 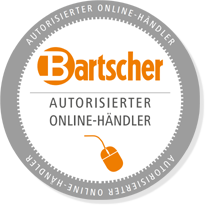 If you need catering needs, they are the brands Bartscher and Apexa always reliable partners.